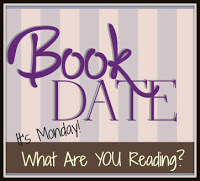 Book By Book: It's Monday 5/1! What Are You Reading? Wow, May 1 already?? What happened to April? The year is flying by, as it so often does lately. I had a pretty good week - mostly recuperating and catching up after not feeling well. I still had a few bad days last week but seem to be past that now. And I had a wonderful weekend escape, a trip to the beach with my two closest friends. We went to a state park, got fresh crabs for dinner, went kayaking, and talked nonstop all weekend! Lots of fun - there's nothing like good friends. Now, I have just a few days to recover and rest up for another trip - to the much-anticipated Boooktopia 2017 with my mom. The problem is that the next three days are packed full, so I won't have the rest time I really need. So, I am a little worried about this next trip...but also very excited to meet these wonderful authors and get together with other book-lovers, including my mom and some friends I met at Booktopia two years ago. Should be fun! Here's what we've been reading the past week - all Booktopia reading for me! I finished The Leavers by Lisa Ko, on my Kindle. This is the story of a boy who's torn between two families and two cultures. After spending his first 5 years in China with his grandfather, Deming rejoins his mother in NYC, where they live together happily with her boyfriend, his sister and her son. When Deming is 11 years old, his mother disappears, and he is adopted by a white family in upstate NY and renamed Daniel. The narrative goes back and forth between Deming/Daniel's childhood and his present life, at 21, and between his and his mother's perspectives. It was completely engrossing - I can't wait to meet the author this week! Now, I am back to another Booktopia book that I started last month and then set aside (to read the library books before they had to go back) - Books for Living by Will Schwalbe, the best-selling author of The End of Your Life Book Club (which I still need to read!). This second book about books is a series of essays about books and life - each chapter focuses on one book and one thing he learned from it. The books run the gamut from classics to children's books to old nonfiction to modern novels and more. I'm enjoying it very much and can't wait to meet the author. I am signed up for one of his sessions, which is like a book group discussion. I have dozens of pages dog-eared for quotes, names of books I want to read, and more. On audio, I finished listening to another Boooktopia book, Celine by Peter Heller, a mystery about an older woman named Celine who is a PI specializing in reuniting families. She is hired by a woman whose father was thought to have been killed by a grizzly bear many years ago, though his body was never found. I enjoyed it - a mystery, yes, but also a character study of Celine herself and her life, while she investigates this case. Plus, I loved the setting in Yellowstone National Park. Now I am listening to another Booktopia novel, Lillian Boxfish Takes a Walk by Kathleen Rooney, a story about an elderly woman walking around Manhattan on New Year's Eve 1984, thinking back over her life and her career as one of the first women advertising executives. I started reading this one in print and have now switched to the audio (I'm trying to juggle my Booktopia books to fit them all in!). I'm enjoying it so far. My husband, Ken, finished The 5th Wave by Rick Yancey, a popular YA post-apocalyptic novel that was made into a movie last year. We've had this book in our house for years, but none of us had read it until two weeks ago. Our son read it, then he passed it onto his Dad. Ken enjoyed it, and they are both looking forward to the sequel. My turn next! Now, Ken is reading one of my review books, due out tomorrow: Crime Song by David Swinson, a sequel to The Second Girl. Both feature PI Frank Marr, a retired cop who was forced to leave early due to his addictions. Jamie, 22, says he is on a science fiction kick! This is a switch from his usual fantasy obsession. After finishing The 5th Wave by Rick Yancey, he also finished reading The Shadowed Sun by N.K. Jemisin, book 2 in the Dreamblood series, which he loves. Now Jamie is reading Columbus Day, book 1 in the Expeditionary Force series by Craig Alanson, a series about an outer space war where the Earth is unsure of who are enemies and who are allies. I wonder if our recent viewing of the TV show Colony is influencing his reading choices! Free Audiobooks - SYNC Season Starts - don't miss this great opportunity for free audiobooks from now through the summer! Steamed Maryland Blue Crabs - first of the season! I'm looking forward to reading about your adventures at Booktopia! Thanks! I'm looking forward to it - the books chosen have all been great! Lillian Boxfish Takes a Walk sounds great. I hope you have so much fun at Booktopia! It's very good, Lindsey - I'm listening to it on audio now. I really should learn to wait to choose my book of the month books until after the Monday update posts! I was *this close* to selecting "The Leavers" and then opted for something else! Oh well, maybe I'll pick it up as an add-on next month.. Yes! I'd definitely recommend that one - very engrossing. The crabs look tasty. Saturday was my the junior to cadette bridging ceremony in San Francisco. My daughter and I are sore and sunburnt from our adventure but we had fun. Come see what I'm reading. Awww...I remember my own Girl Scout days! Though our bridging ceremonies were held in the school auditorium. Sounds like fun! Nothing I've read! Though you are reminding me that I need to get to Fifth Wave! I know - summer and the Big Book Challenge are coming up fast. My sons will be home from college in a few weeks! Me, too, Jane!! I bet it will be good on audio - read by the author, I am guessing? I get to meet him on Friday - can't wait! Celine was good! I really enjoy graphic novels or memoirs and that sounds like an intriguing one - always love your suggestions! I am so intrigued by Books for Living - I have a special affinity with books about books - I immediately placed it in my to-find list in Goodreads.